Pitch your tent in our beautiful Dartmoor valley and start camping on Dartmoor, surrounded by woodland and streams. Our campsite comprises of 15 pitches, each separately marked out pitch has plenty of space for a decent size tent and one car, however there are parking spaces nearby for additional cars. Ideal for those who want a Dartmoor camping experience. There is lots of room for the children to run around in, explore in in the woods and play in the stream. Also why not have a good old fashioned camp fire! Each pitch has a designated fire pit and logs are available on site. Is there a better way to escape the fast pace of the city? 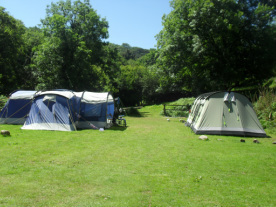 Camping on Dartmoor in a family friendly campsite is the perfect way to relax. There are tons of local attractions suitable for families or couples of all ages. We allow Dogs to stay at the campsite, we're pretty certain Fido will have as much fun as you sniffing around the great outdoors. Respectful pet ownership goes with out saying as we are a working farm. Children love it on the farm! There is plenty for the children to do when you visit our campsite from feeding tame lambs, pony rides and exploring Dartmoor valleys and woodland which is a short walk from the site!